Acacia pravissima “Bushwalk Baby” is a low growing form of the usually upright A. pravissima, the Ovens Wattle. “Bushwalk Baby” develops into a mounded ground cover reaching a height of 50 centimetres with a spread of 1.5 metres. The phyllodes are small, wedge-shaped and grey. They are arranged spirally around the stems. Yellow flowers are held in globular clusters and cover plants in spring. As the flowers fade cut off each branch behind the spent blooms. This will maintain the plant’s bushy growth habit. 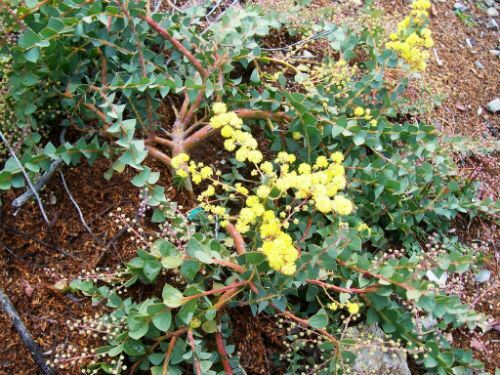 Growth habit, foliage and flowers are all attractive features. “Bushwalk Baby” would be an ideal addition to a rockery or cottage garden. The cultivar could be grown in a container where it will spill out of the pot. In a garden bed this would be an ideal border plant. In our cold climate garden “Bushwalk Baby” has proved to be very hardy once established and free flowering.